Military Cemetery/Memorial / Fynwent milwrol: Sunken Road Cemetery, Boisleux-St Marc, Arras. Pas de Calais. 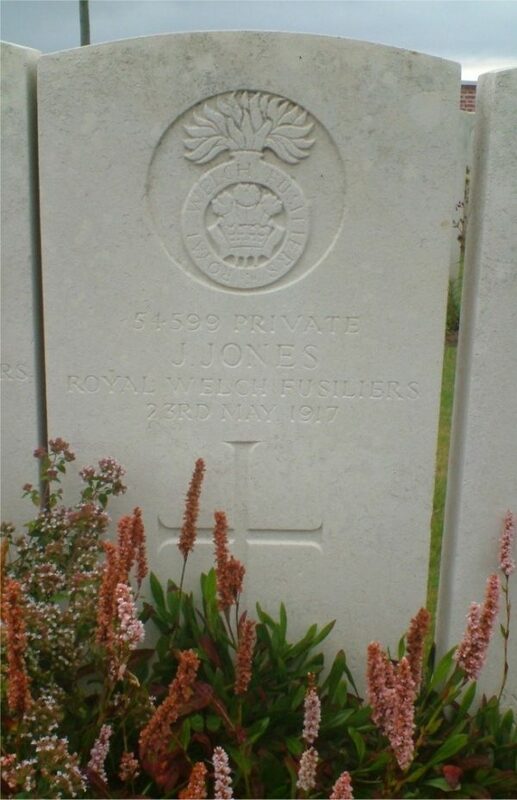 Joseph Jones died on 23rd May 1917, from wounds received in action at No 20 Casualty Clearing Station. He was 23 years old. Joseph Jones was, according to the 1901 & 1911 Census, born in Abergele in about 1894. He was the son of John and Elizabeth [Lizzie] Jones. The family spoke both Welsh and English. The 1901 Census records the family living at an address in Llanddulas. John Jones’ occupation is recorded as, “General Labourer”. Joseph is shown as the third of four children. Elizabeth aged 11 years and Thomas aged 10 years being the elder, and Samuel aged 2 the youngest. Given that Joseph’s name appears on the Abergele National School Memorial [Andrew Hesketh Abergele Post], it is assumed that he was a pupil there. By the time of the 1911 census the family are back in Abergele living at 13 Jenkins Street. John Jones’ occupation is now recorded as “Limestone Quarryman”. [There is still a large Limestone Quarry operating at St George, close to Abergele]. The family composition is unchanged. Joseph’s occupation is recorded as “Butchers Assistant”. According to Andrew Hesketh [Abergele Post website] Joseph worked as a slaughter man for Mr Vaughan of Gwalia House, an Abergele butcher. 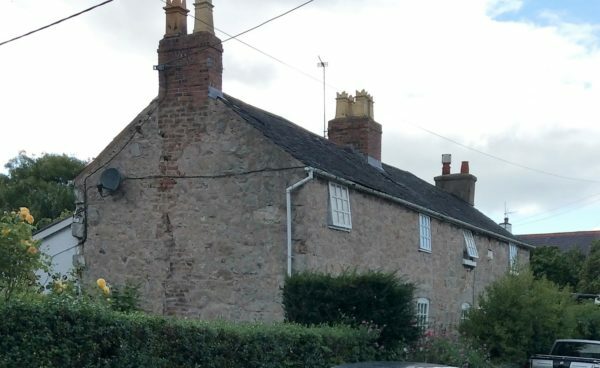 On the 19th November 1914, he married Jane Ingleby of Rose Cottage, Church Street, Rhuddlan, [the sister of John Ingleby who is also remembered on Rhuddlan’s memorial], at Ebenezer Calvinistic Chapel, Rhuddlan. On the marriage certificate she reported her age as 25 years and Joseph gave his age as 21 years, occupation Butcher’s Assistant. He gave his address as, 9 Rhuddlan Road, Abergele. On the 3rd November 1916 Joseph made a will [Ancestry] in which he left his estate to his wife, Mrs Jones, Llanfair Terrace, Church Street, Rhuddlan. On the 23rd May 1917, he died of wounds at No 20 Casualty Clearing Station, [possibly sustained during the battles around Arras?] His death is reported in the Rhyl Journal 9th June 1917 which records that he was a native of Abergele,[where his parents still resided and son-in-law of Mr & Mrs Ingleby] and at the time of enlistment, was employed by E. P. Roberts, Butcher of Rhyl. It reported that he died of gunshot wounds and left a wife and two children. By coincidence, Joseph died on the same day as Robert Vaughan, who is also commemorated on the Rhuddlan War Memorial. Llanfair Terrace, Church Street, Rhuddlan. Joseph’s Widow Jane, [now calling herself Margaret Jane] subsequently remarried. Her civil marriage to Richard Moody was registered at St Asaph, during the June quarter of 1919 [Free BMD]. On 27th August 1919 a War Gratuity of £2.19s was authorised for payment to his wife and sole legate, Jane Moody [Soldiers Effects Ancestry]. 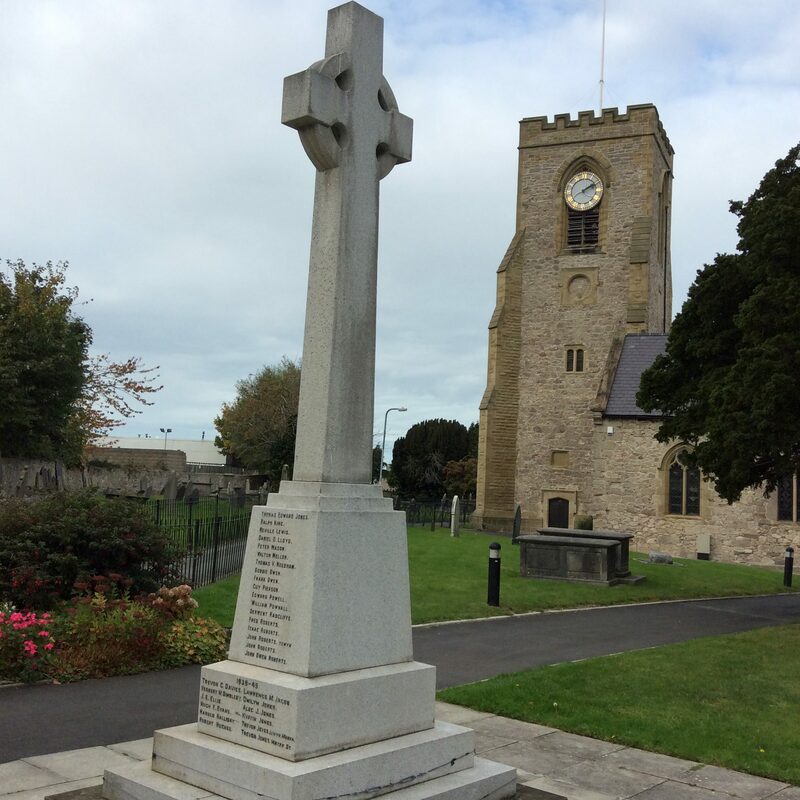 Joseph is remembered on Rhuddlan & Abergele War Memorials, Rhuddlan Royal British Legion Roll of Honour [in the Community Centre], St Mary’s Church Scroll of Honour & Window, Ebenezer Chapel Memorial Chair, Abergele National School Memorial and the North Wales Memorial Arch Bangor. He is also commemorated on his parent’s headstone in Abergele Churchyard.